This design was drawn for a client who wanted to sort out the detailing for himself. As a result, it is a partial design only. Available information comprises lines, offsets, sail and rigging plan, a few construction sections and my standard detailing covering steel construction details and construction of the gaff rig. If you feel happy to build her from that basic information, then her design is available at a low price. Alternatively, I am available to provide additional detailing for further aspects of the boat, right through to complete detailing if needed. Please contact me by email to discuss these options if they interest you. "Spirit of Malverne", the boat in the photoraphs, sails at 10-12 knots in most conditions but reported a top speed of 19 knots during a downwind voyage in the trades from Cape Town to the island of St Helena. 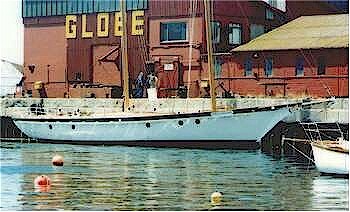 On the windward return trip she steered herself continuously, unaided by autopilot or anyone correcting her, for 10 days. She would be a great charter boat, combining space, comfort and character. 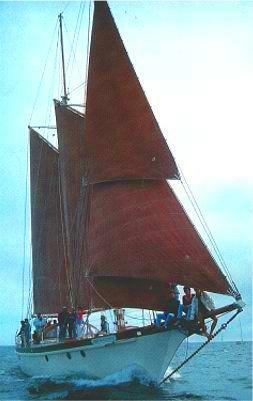 She also has loads of carrying capacity, making her a wonderful trading schooner.